The cider mill was built by Frank Moes in 1916 and has remained in the family. We stopped pressing in 1996, and are again up and running and celebrated 100 years in 2016. Frank Moes, born in 1878 in Marysville, Ohio, and Rose Leiderbach born in 1888 in Cleveland, Ohio, married in 1910. They were fruit growers on his father’s land and built the mill in 1916 to press grapes and apples from their farm and for neighbors. Three children, Nelson, Edna, and Julius (Mike), were all born in the farmhouse. Fall was a busy time with grape and apple picking, and sometimes the press operated nearly all night to get the work out. Nelson, (Frank and Rose’s first child, born in 1911) started making cider when he was a boy. He stood on barrels to reach his father’s cider press. He married Alice Bartter from Cleveland, Ohio, (born 1915) on December 6, 1941, a day before the Pearl Harbor attack. After serving in the U.S. Army, Nelson, a National Tube/U.S. Steel millwright, continued the seasonal operation, adding a farm market stand, and together with Alice, and eventually their four children and nine grandchildren, ran a lively business. 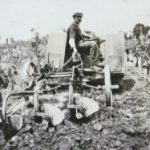 Many of the acres of vineyards and orchards had given way to developments in the neighborhood, but the press continued to produce hundreds of gallons of juice pretty steadily with apples and grapes purchased from local growers, as well as with a great deal of custom pressing for individuals and farmers bringing apples anywhere from one to hundreds of trees. Talk of new laws for cider makers was looming, and it seemed imminent cider would eventually require pasteurization. Our family agreed flavor and goodness would be lost, and with that and busy lives, the cider mill operation closed in 1996.